About the New Forest and its status as a National Park. Information on towns and villages with interesting facts and photos of the National Park boundary markers as well as useful New Forest numbers and links. 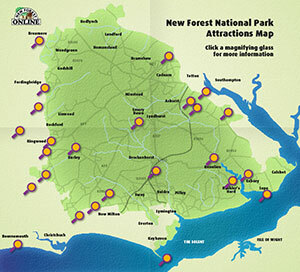 Tourist information and history about the New Forest and its status as a national park - the smallest in the UK. All about the New Forest towns and villages - with three interesting facts about each one... three 'curiosities', if you will! 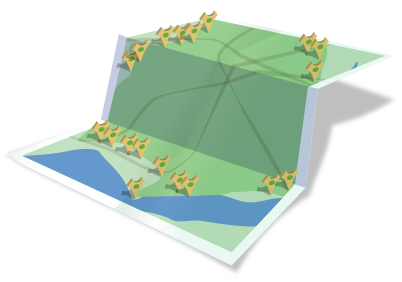 The New Forest National Park boundary - an interactive map showing (most) of the wooden and (some) zinc markers placed around the perimeter by the New Forest National Park Authority. Photos of every marker and the surrounding area give a taste of the countryside and urban areas of the New Forest. 16 stunning camping and caravanning sites, including 10 within the New Forest. In an emergency always call 999 in all other circumstances, you should phone 101. If you find a sick, injured or dead pony, cow, donkey, pig or sheep (other than one involved in a RTA), call 02380 282052 during normal office hours, or 02380 283141 at other times. For sick or injured deer, ring the Forestry Commission on 02380 283141.